An update about what’s going on in the business of wine, consumer choices and stuff you should know about. HR 1161, a bill written by beer distributors, would eliminate a consumer’s right to direct-ship alcohol to his/her door, now has 100 supporters in Congress. Not to fan the flames of controversy, this bill particularly irks me now that I work for a winery. Small, family-owned wineries would be particularly hurt by the bill since so much of their living is made with direct-to-your-door sales. Read more about the bill and how you can get involved in defeating it. I watched Ken Burn’s Prohibition documentary series on PBS. So rich with content and intellectual discourse (but not in a preachy way), it’s absolutely worth watching how this failed experiment reached far and wide to screw so many things in this country. You can still see it streamed on PBS.org. With all the talk about the challenging (and chilly) 2011 harvest in California, I found it ironic that USA Today printed a story about how global warming will affect where grapes will be grown as soon as 30 years from now: Read more. 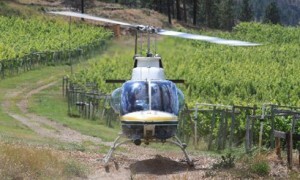 And how about this new-fangled method to dry out soggy grapes after the rains in Napa: by helicopter. Talk about a carbon footprint… Read more. Wanna Job in the Wine Biz? Dr. Vino, a pretty big wine blogger, has launched a new wine business job board. Sales, somms and buyers, oh my!